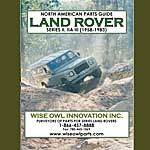 Wise Owl was based in North Vancouver Canada. The parts side of the business was sold to Rover Park Boys of Alberta Canada, which subsequent went out of business. Ray Wood kept the parts manufacturing side of Wise Owl, which evolved into Rocky Mountain.